Tired of bars and springs poking into your back? Avoid discomfort with this hot new model from American Leather. The Conley Queen, in fabric, features a wooden platform for ideal comfort and support. The Conley opens up effortlessly to provide an excellent sleep solution for you or your guests. A transitional model, the Conley High Leg Comfort Sleeper offers the best in style and sofa bed technology. The Conley is available in seven sizes and a vast array of designer upholsteries. 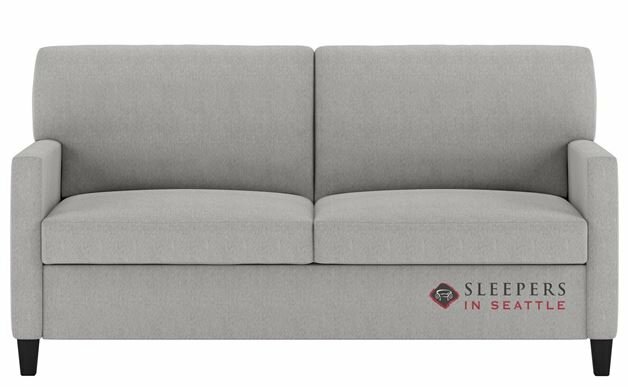 A new Generation VIII Comfort Sleeper, the Conley features a new arm style, more streamlined design and improved mattress options. JUST ORDERED!! I know it hasn't been delivered yet but I tested it on in person several times, and my sister has another model (also a Comfort Sleeper). I am so excited to receive our Conley... The bed is the best for any sleeper I've been able to find. They are pricey, but i just got ours on sale ;)! The staff was terrific--I almost purchased a couple of months ago, but reallllly wanted to save some money, and time wasn't a huge factor, so they told me in advance about the upcoming sale and then followed up when the sale actually started. Can't wait! !